Scenario: I got a late start due to rain in the morning, so Ann and I rushed everything together and shoved off from the Jacksonville free dock on Sister’s Creek headed to Fernandina. I had just downloaded a new iPad navigation app but with no routes. I knew that the passage through the Fernandina shallows was difficult due to all the unmarked shoals so I opened Waterway Explorer with Safari on my iPad and searched for Fernandina. Two Nav Alerts came up. I chose one and saw a route available for download in GPX format. I tapped on the route, which then gave me the choice of which app to use and voila! I had a route to follow with 9 MLW! Fernandina was a piece of cake after that. Along the way I saw a sailboat in the famous shoal by R2 and another one that ignored G1A and G1B that was also aground. I had no problem. The cost of the app was peanuts compared to a tow. Direct Route Importing w/o PC: This uses the iPad’s “Open In” option which is very handy. 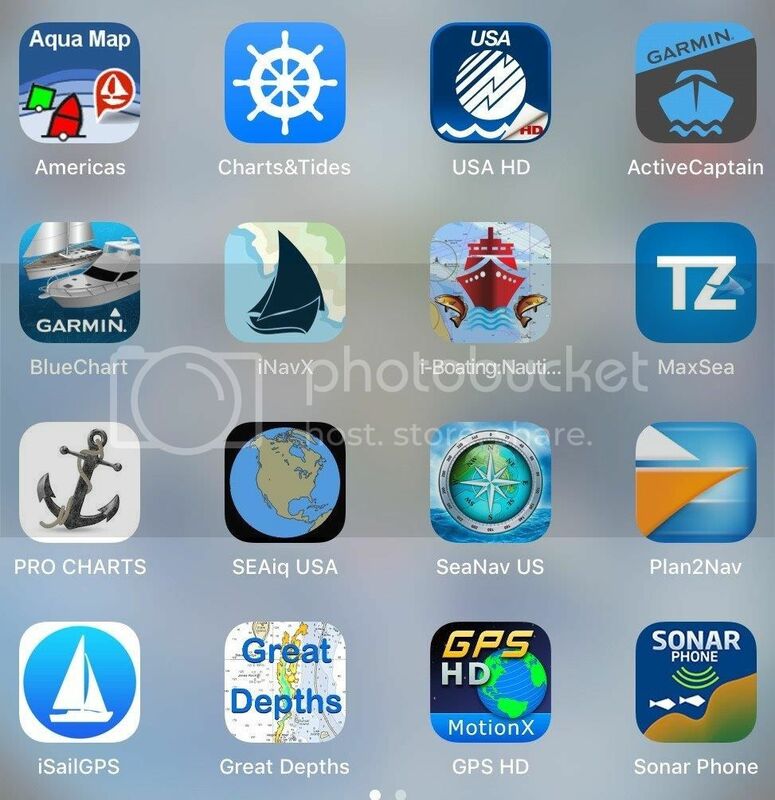 Apps with this function: AquaMap, I-Boating, SEAiq, iNavX, and iSailGPS. Direct Route Exporting w/o PC: With this option you can share routes between apps on your iPad or with a cloud service. Apps with this function: AquaMap, SEAiq, iNavX, and iSailGPS. Selectable AIS Vector Length: Choose the length in feet or nautical miles of a line from the target’s bow. MaxSea TZ and iNavX provide this feature. Selectable AIS Vector Time: This is my favorite. If both the boat and AIS target are set to draw a line 10 minutes long (the length then varies by speed), then it’s easy to see if a collision is in your future. MaxSea TZ and iNavX let you select the vector length based on where the target will be in a number of minutes. So, what do I use at the helm? Now it’s AquaMap since it has all the features I consider important, and I also use Navionics for their SonarChart feature. It helps navigate some of the shallows of the ICW, but you must be careful in some shallow areas when you see contour lines showing wide swings in depth. It’s an indication that the contour lines may not be correct, and you should proceed with an extra measure of caution. I also use SEAiq from time to time just to be sure I have absolutely the latest NOAA ENC chart for a particular location. Great article Bob! Thank you for publishing it. Do you know which apps have the Bahamas Explorer Charts and routes? ,Excellent article, Bob! Thanks for undertaking this. It’s sure to be a big help to all who are trying to figure out which way to go since the demise of Blue Chart Mobile. Great work as usual Bob. I am wondering why you did not include OpenCPN? Bill, good question. The apps tend to have exclusive agreements with Bahamas charts. Perhaps it could be a line in the spreadsheet. 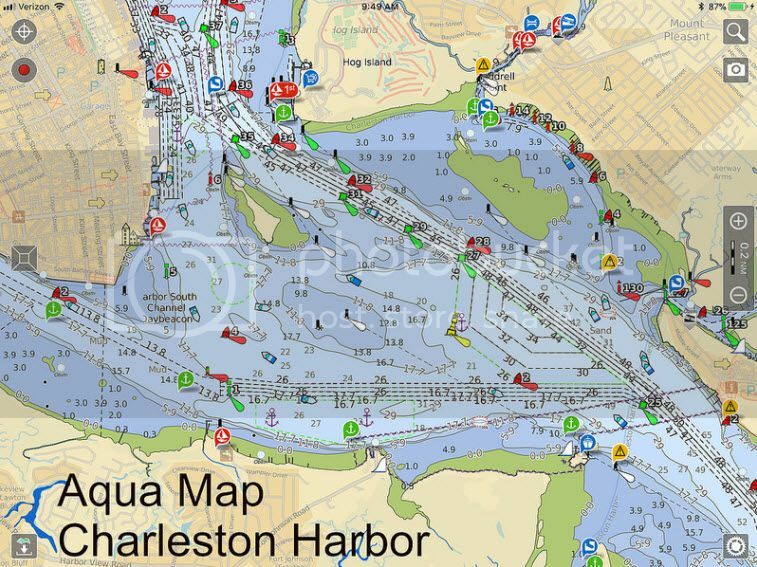 Aqua Map has a free version with a demo chart and it’s only $19.99 for the entire US with forever updates (no subscription) for the iPad. Stephanie, glad to be of service! Jonathan, I use the PC version of OpenCPN all the time for planning, it’s an outstanding product but there’s no iPad version. "The NOAA RNC (raster) and ENC (electronic) charts have been updated for months on the NOAA site" is this sentence missing the word NOT folloing the word have.? iNavX can use quilted charts from Fugawi, such as Fugawi Aboard USA which is based on NOAA RNC. But you have to pay extra for those. Thanks, Bob, for the thorough review of so many resources (I have used your comments on various resources going dow the IC many times). I think one of the factors that is often overlooked by App users is how it gets GPS data and what that does to battery life. Unless you can get GPS from another source via wifi or BT, using the internal GPS can really crush the battery on your mobile device. It is very handy to have a 12V or USB port near by to keep it running for long days underway. But, once you are "plugged in" your device is no longer very "mobile". Keep up the good work! Good article Bob. I've used iNavX (with Navionics charts and WG overlays) for years now. I've played with some of the others - but agree with your overall run-down (I've done a few videos on this as well). We ran full integration with instruments and AIS via the iMux and absolutely loved it. I won't buy another MFD. And for me, iNavX is the most full-featured app I've seen. Finally, thanks for the heads-up on the Waterway Guide route download capability. I really hope they expand this. I love the seamless integration of pulling the GPX file into the app. Very cool. Bob great work, many thanks. I do not see the ICW magenta line on Aqua Map is it a setting or just not shown? Safe travels north. Thanks. Very good article, although I am not sure when you say that iNavx allows exporting routes with photos if you really mean routes, or rather tracks. If there are photos attached to them, I presume it might rather be tracks. My two main criterias are 1) ease of use by newbies (people coming on my boat who have never sailed before) and 2) exporting tracks with instruments output in order to automacially create a log book. Navionics is the best app in my opinion regarding ease of use, but it does not link to instruments neither does it export tracks. 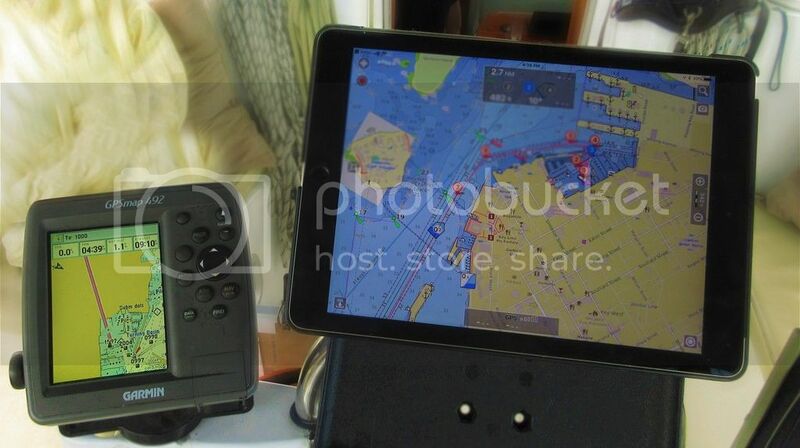 So I stay with iNavx although it is far from being as user friendly as Navionics. One interesting thing to remark is that Navionics advertises that its charts are usable by other applications (meaning other applications, rather than downloading their own charts, may acces the charts in Navionics). Unfortunately, no application seems to use this feature. (I had to buy the same charts twice, for Navionics and iNavx.) Plus a very annoying problem: iPad Navionic charts cannot be used on the iPhone. Navionics says it's because of the inferior resolution, which is obviously false since iPad charts work on my iPad II but not on my iPhone 7 plus, which has a higher resolution! Last, you didn't test Weather 4D 2.0! Outstanding recent and comprehensive review of navigation apps! Bravo Bob! I will share your article (link) with others because you have covered so much so well. One thing I think could be clarified: You mention SEAiq and in your review you wrote that it costs $49. There are several versions of SEAiq, (for example the “Pilot” version is for commercial pilots). I think most boaters in the USA would choose to use the SEAiq USA version (for recreational boaters) which has a free trial download and is only $4.99 (less than $5) for the Premium Feature set that is included in the trial version. It does allow use of free NOAA charts for the USA waters (including USVI), and can display raster or vector charts. Unless I am doing something wrong the current SEAiq does not have access to active captain. I still have the old information prior to May 2018 data, but can not update AC since then. I have heard they were thinking of making that available again, and hope they do so. The SailTimer app has a useful feature for sailing that wasn't mentioned here (www.SailTimerApp.com). It is an example of how quickly apps are evolving with new features. Out of all the chartplotters and apps available, this is the only product that accounts for tacking distances to display your Tacking Time to Destination (TTD). It just needs a waypoint and wind speed & direction, and provides an easy display of your optimal tacks. It can even learn your boat's polar plots, so that your boat's speed on different points of sail is accounted for along with tacking distances. It is a free app, with low-cost raster charts available plus you can import your Navionics charts and tide data. Thank you Bob - your article saved me countless hours of research time. Superb detail and practical observations in a segment that has a bewildering number of choices and options within those choices. So looking forward to trying out the new app on the water, but it'll have to wait for mother nature to come 'round - I'm not that good a paddler that I want to challenge the ice up here in Canada - at least not with a carbon-fibre kayak! Thought you'd be amused to know that even kayakers are reading your article and finding it a great help.